The Sand Flats Recreation Area is a fee area. If you pedal in on a bike, the fee is $2. Cars are $5. More info and up-to-date entrance and camping fees here. Sand Flats Rd. 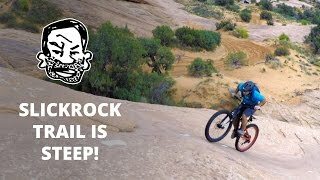 is not something you'll seek out to ride but it's a useful link-up or bail-out for classics such as Slickrock, Dave's Trail, Porcupine Rim, UPS, LPS, and, of course, The Whole Enchilada. Additionally, this is the final 16 miles of the Fruita-Moab Kokopelli Trail. The first ~two-three miles from town are paved (and steep!) but it's all dirt after that. There is a lot of paid camping along this road and thus, if you're camping here, you'll likely pedal this road at the beginning or end of some rides.